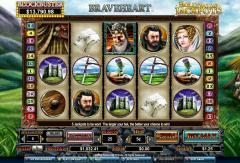 The highlight of Braveheart slot game is the audio visual battle scenes from the movie. The introductory movie clip has a collage of scenes. Scenes of Scottish and the English armies racing out to battle shouting their war cries appear in the Battle Free Games Feature. The animation in the scatter symbol shows the axe and scabbard giving way to a battle scene. The animation in the Braveheart wild symbol is also attractive. Braveheart raises his sword and exhorts his soldiers to fight. 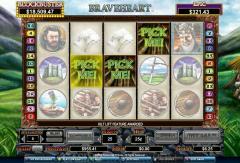 Braveheart is a 25 payline slot game with the coin denomination range varying from 0.01 to 20.00. Only one coin can be wagered per payline. Braveheart is the wild symbol. When it appears in winning combinations the payouts are doubled. 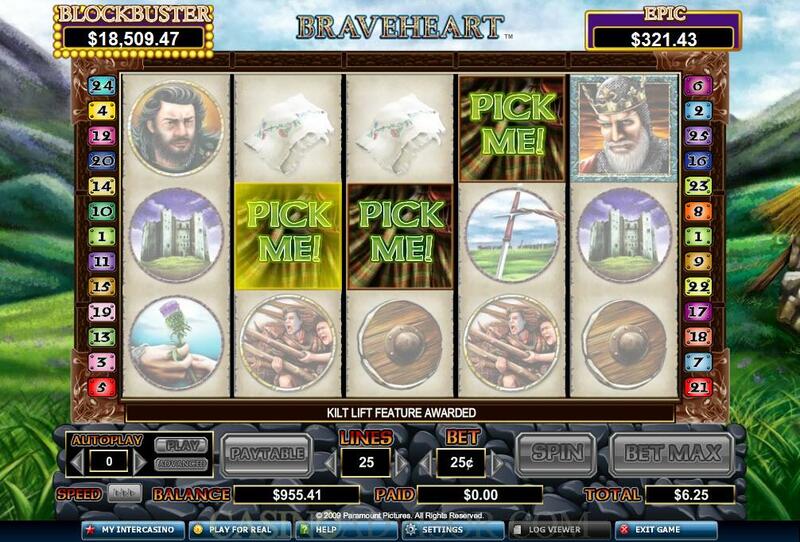 Five Braveheart symbols in an enabled payline offer the largest fixed jackpot of 2,000 coins. The Battle Free Games feature is triggered when three or more scatter Weapons symbols appear anywhere on the reels. 10 free spins with doubled payouts are awarded. During the free spins a battle between England and Scotland is shown on the reels. Each time a Braveheart symbol appears on the reels the Scottish side advances by one point. Each time a Longshanks symbol appears on the reels the English side advances by one point. If at the end of the Battle Free Games feature the Scottish are ahead then the player wins a Battle Bonus of up to 100 times the triggering bonus. The Battle Free Games feature cannot be retriggered. The Kilt Lift feature is the bonus game on the second screen. This feature is triggered when the Kilt symbol appears on Reels 2, 3 and 4 at the same time. The player gets to pick a kilt to win the revealed prize. The player may also get a second pick or a ‘win all’. In total the player can win up to 50 times the triggering bet in this feature. The Kilt Lift Feature can be won during the Battle Free Games feature but the prizes are not doubled. 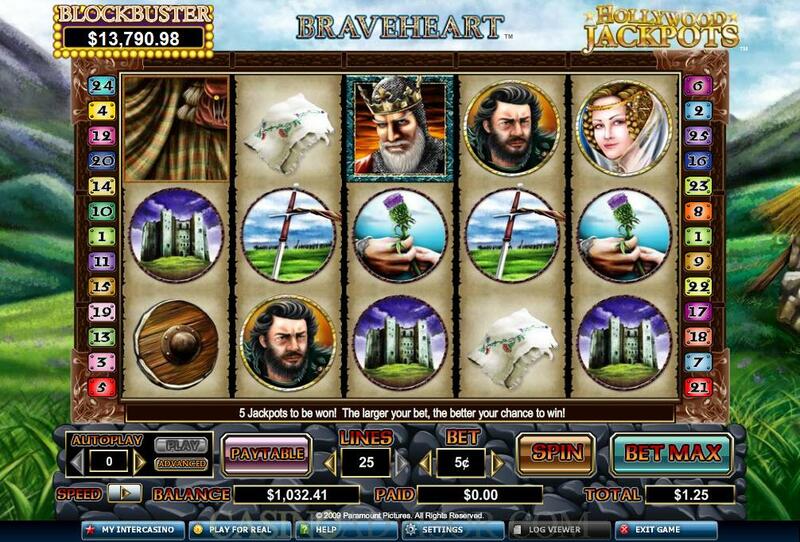 Braveheart is linked to a progressive jackpot network appropriately called Hollywood Jackpots. This network has five levels. These are named after the various types of ratings that are given to Hollywood films. The five levels in order of increasing size are Smash, Epic, Classic, Acclaimed and Blockbuster. All jackpots are triggered randomly without the need to align any symbols on enabled paylines. Interested in reading more detailed information about Braveheart? If so Click Here for more details.